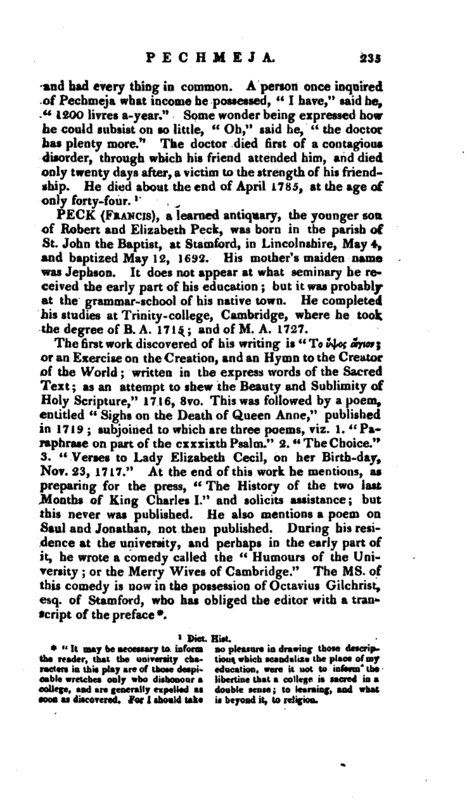 , a learned antiquary, the younger son of Robert and Elizabeth Peck, was born in the parish of St. John the Baptist, at Stamford, in Lincolnshire, May 4, and baptized May 12, 1692. His mother’s maiden name was Jephson. It does not appear at what seminary he received the early part of his education; but it was probably at the grammar-school of his native town. He completed his studies at Trinity-college, Cambridge, where he took the degree of B. A. 1715; and of M. A. 1727. "It may be necessary to inform the reader, that the university characters in this play are of those despicable wretches only who dishonour a college, and are generally expelled as soon as discovered, For I should take no pleasure in drawing those descriptions which scandalize the place of my education, were it not to inform the libertine that a college is sacred in a double sense; to learning, and what is beyond it, to religion. 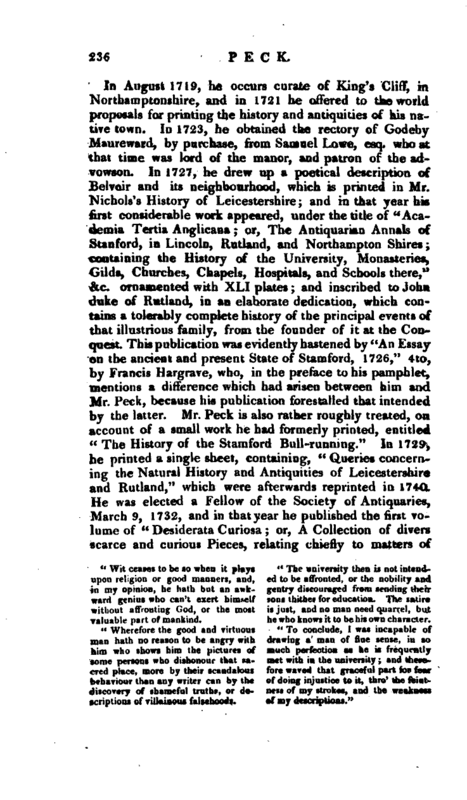 In 1742, Mr. Peck published his last work: “Four Discourses, viz. 1. Of Grace, and how to excite it. 2. Jesus Christ the true Messiah, proved from a consideration of his miracles in general. 3. The same proved from a consideration of his resurrection in particular. 4. 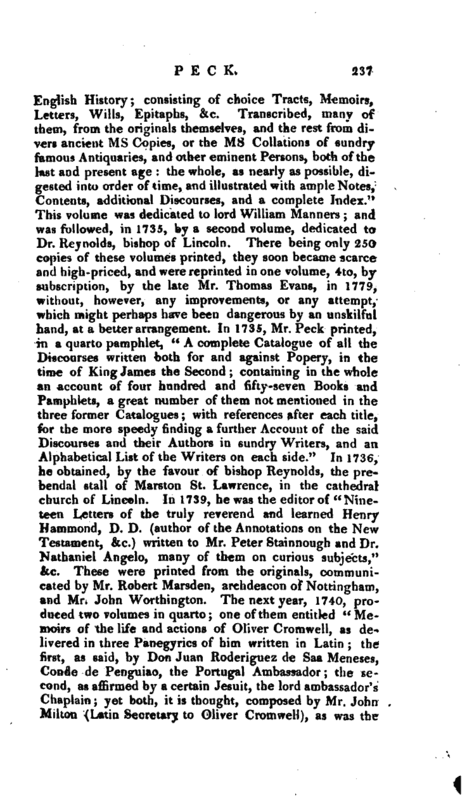 The | necessity and advantage of good laws and good magistrates: as delivered in two visitation and two assize-sermons.” At this time he had in contemplation no less than nine different works but whether he h&d not met with encouragement for those which he had already produced, or whether he was rendered incapable of executing them by reason of his declining health, is uncertain; none of them, however, ever were made public. He concluded a laborious, and it may be affirmed, an useful life, wholly devoted to antiquarian pursuits, Aug. 13, 1743, at the age of sixty-one years. He was buried in the church of Godeby, with a Latin inscription. 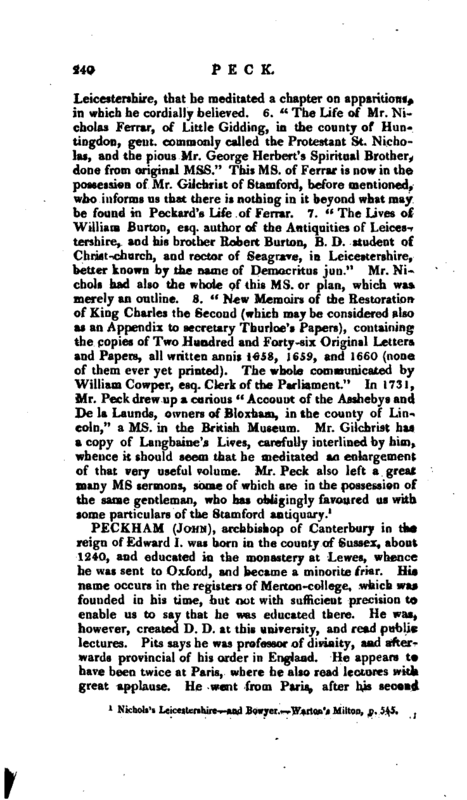 There are two portraits of him; one in his “Memoirs of Milton; the other prefixed to the second edition of his” Desiderata Curiosa,“inscribed,” Francis Peck, A. M. natus Stanfordias, 4 Maii, MDCXCII." 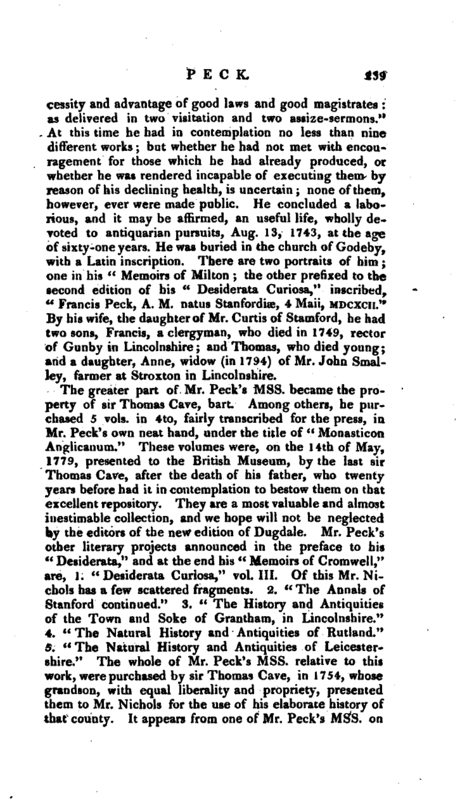 By his wife, the daughter of Mr. Curtis of Stamford, he had two sons, Francis, a clergyman, who died in 1749, rector of Gunby in Lincolnshire; and Thomas, who died young; and a daughter, Anne, widow (in 1794) of Mr. John Smalley, farmer at Stroxton in Lincolnshire. Nichols’s Leicestershire and Bowyer. 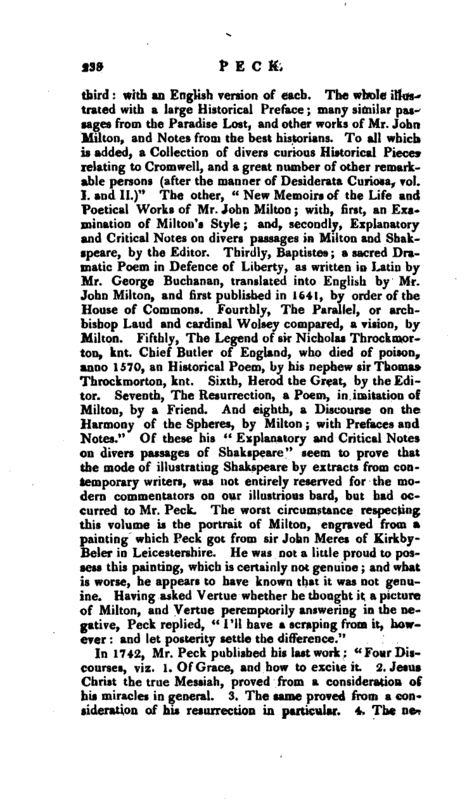 Warton’s Milton, p. 545.